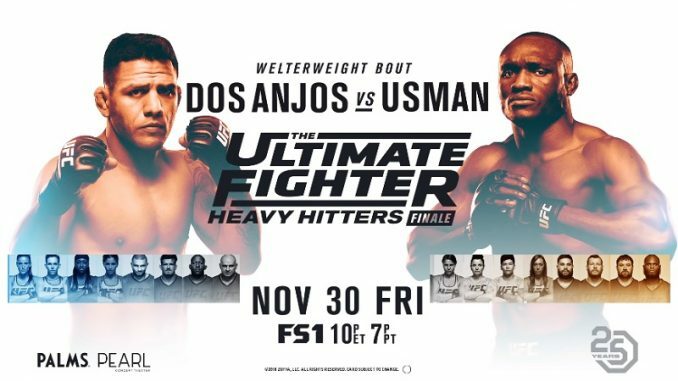 John Pollock goes through Friday's TUF 28 Finale card that saw Kamaru Usman dominate former lightweight champion Rafael dos Anjos over five rounds in Las Vegas. The UFC presented the TUF 28 Finale card on Friday night from The Pearl at the Palms in Las Vegas, Nevada. The show featured Brendan Fitzgerald and Jimmy Smith on the call. Barcelos was a big favorite at minus 550 and the biggest on the card. Gutierrez was comfortable circling around on the perimeter while Barcelos tried to figure out the timing. Barcelos got him down onto the canvas. Barcelos walked through an up kick to get side control but could not do anything when he attempted to pass to mount. I scored the first round 10-9 for Barcelos. Barcelos saw the takedown early in the second round and took it. From his back, Gutierrez cut open Barcelos with an elbow strike over his right eye. Barcelos moved to the back and then to half-guard as he threw elbows on top. With less than one minute remaining, Barcelos made a slick transition to the back applied the fight-ending rear-naked choke. After the fight, the extent of the cut over the eye of Barcelos was shown and looked so terrible to the point that the fight may have been stopped between rounds if he didn’t finish him. Gutierrez landed one big strike in each round but it was it was Barcelos’ fight, especially in the second round where he withstood the cut from the elbow and took over with his ground and pound. Barcelos improves to 12-2-1 and earned his second win in the UFC after his promotional debut win over Kurt Holobaugh this past July. He hasn’t lost in over four years. Means was a sizable favorite going into the fight. After withstanding an early eye poke, Means resumed the fight and took Rainey down despite a blatant fence grab by Rainey. Means achieved top position and unloaded with strikes and the fight was stopped after several unanswered strikes. This was a great performance from Means, who was coming off two split decision losses and was his first stoppage victory since August 2016. Means challenged Diego Sanchez for his next fight. Roosevelt was very quick with his right hand and landing it without needing to set it up. As the round continued, Roosevelt started piling up with the right while the short bursts from Horcher were not landing clean. Roosevelt had his back against the fence and out of nowhere locked on a guillotine and nearly lifted Horcher horizontally off the canvas, adjusted the choke and got the tap. The submission was impressive and showcased a mix of technique and strength to end the fight in seconds after being clinched against the cage. Roberts earned a shot after winning on Dana White’s Tuesday Night Contender Series this past July. Roberts has an undefeated pro record of 6-0. He said he is coming for Mike Trizano, who won the lightweight tournament on TUF Season 27. Both women were part of Team Whittaker on the current season of Ultimate Fighter. Letson lost to finalist Macy Chiasson in the semi-finals and Stoliarenko lost to the other finalist Pannie Kianzad in the other semi-final. Letson had success with her left hand going in and out and connected with it. Letson put together a combination that worked and followed with another left hand. The first round easily went to Letson 10-9. Letson had no problem stopping several takedown attempts by Stoliarenko. They exchanged and Stoliarenko landed her best shot so far in the fight with a right hand and an elbow that cut Letson. The second round was closer than the first, but I still had the round for Letson and ahead 20-18. Stoliarenko was more comfortable with her hands at the start of the third round. She scored her first takedown and transitioned to a guillotine on Letson, which she popped free from. They finished the fight on their feet after a stand-up and I felt Stoliarenko won the last round but have it 29-28 for Letson. It came down to the second round, which was the closest of the three rounds. Letson has only been fighting professionally for four years and fought one fight in Invicta FC before entering this season of Ultimate Fighter. She improves to 4-1 and has not lost since her pro debut. These two heavyweights were part of this season of Ultimate Fighter. Green lost to Juan Francisco Dieppa and Batista lost to Justin Frazier in the semi-finals of the tournament. Greene is 6-foot-7 and his reach is 80.5 inches. Batista is a world-class freestyle wrestler who won gold at the Pan-Am Games in 2007 and represented Cuba at the 2008 Olympics in Beijing. Batista got the takedown after eating some elbows to the side of the head, but Greene has long legs and was able to apply a triangle and Batista reluctantly tapped out. Greene improves to 5-2 and all his wins have been first-round victories with three by a triangle. Perez was the betting favorite coming into this fight. Benavidez threw a pair of strikes and one rocked Perez. Then we had one of the strangest sequences in recent history. Benavidez was on top landing tons of strikes to the head and Perez was not defending. Referee Yves Lavigne stepped in to stop the fight but got gun shy when Perez grabbed for a single leg and backed off. Benavidez stopped punching because he thought the fight was over and then had to continue when he realized it wasn’t and Lavigne took back his call. Benavidez got the same position a minute later and stopped the fight with his ground and pound. This could have been a disaster had Benavidez not finished the fight a second time and put him in a terrible position. It was a credit that Benavidez was composed and just kept fighting. Jimmy Smith lost it on the air yelling about the poor officiating. Marc Ratner spoke on the broadcast and called Lavigne “indecisive” and that it could have cost Benavidez the fight. Benavidez defended Lavigne and said he was trying his best as an official. There was a shot of Lavigne and it appeared on camera that he knew he blew the call. Benavidez said the flyweight division is more entertaining than ever and wants to challenge the winner of Henry Cejudo and T.J. Dillashaw and yelled, “we aren’t leaving”. Benavidez’s record is incredible at flyweight and won seven of his last eight. Now, Demetrious Johnson finally leaves the UFC and there is a champion Benavidez holds a win over, and they’re likely closing the division. Glenn missed weight on Thursday at 148.5 pounds. Glenn entered with a shot and ate a big right hand from Aguilar that stunned him. Aguilar landed with two shots to the body one more to the head. The first half was Glenn’s round, but it turned around with that big right hand and Aguilar’s half of the round was stronger and won the round on my card. Glenn’s right eye was very swollen. Aguilar mixed body shots with strikes to the head while fighting at distance. Glenn still landed with some big shots, but it was Aguilar’s round with significantly more shots and slowed down Glenn, likely from the volume of strikes to the body piling up. The third round saw Glenn continue to move forward and they were matching each other’s strikes. Aguilar dropped Glen with an overhand right and he attacked on top with elbows from half-guard. He took the back of Glenn but lost it and went back to half-guard. Glenn’s face was a mess and his right eye looked completely closed. They got up for the final minute and Glenn landed a solid right elbow to end the fight. This could have been 10-8 for Aguilar and I scored it 30-26 for Aguilar. This was a great fight. Aguilar improved to 15-1 with this victory after winning on Dana White’s Tuesday Night Contender Series in July. The only loss in his career was to Leonard Garcia in December 2013. Glenn falls to 21-5-1 and is now 3-3 in the UFC. Kim missed weight for the flyweight fight by 4.5 pounds. In the first round, Shevchenko lost her balance momentarily and Kim connected with two right hands. Shevchenko landed with a combination and got a throw to end the round. Shevchenko won the round with the higher volume of strikes landing. Every time Shevchenko did something positive, her sister Valentina would yell, “HEY” and given how frequent this was it told me that Antonina was doing well unless Valentina has learned from Greg Jackson. The second round was all Shevchenko with jabs and movement as Kim had trouble finding her reach and dealing with the speed. The third round saw Shevchenko take her down and work in Kim’s guard. Shevchenko landed a knee to the chin of Kim while she was grounded and was warned by Yves Lavigne but did not lose a point. The story of this fight was displayed in the significant strike stats where Shevchenko out landed Kim by more 40 but Kim’s output was higher. I had Shevchenko winning the fight 30-27. Shevchenko looked excellent in the fight and never appeared in danger. She is 6-0 as a pro fighter and is going to be one of the better fighters at the weight class. Unfortunately, if her sister wins the title next weekend it’s going to put her in a position where she will have a ceiling and outside the title picture. Shahbazyan is only 21 years old and is the betting favorite as the undefeated fighter coming into the fight. He has finished every opponent in the first round. He is managed by Ronda Rousey. Shahbazyan got control of Stewart’s back immediately and cut Stewart over the right eye. He had control of Stewart throughout the first 3 ½ minutes of the round. Stewart unloaded and landed a big right hand while chasing him. Shahbazyan won the first round 10-9. The second round wasn’t very exciting with Shahbazyan controlling Stewart through his body control and superior grappling all round. Shahbazyan was up 20-18 after two. The third round picked up where the last left off, but Stewart let loose with his striking and nailed Shahbazyan with elbows standing. They were reset in the middle and Stewart swept the leg and started attacking with hammer fists on top. Shahbazyan was exhausted and resorted to his superior takedown ability and subdued Stewart for the rest of the round. Stewart round the final round but my card was 29-28 for Shahbazyan. Shahbazyan improves to 7-0 but had never been out of the first round before so this was a positive to go the distance. Caraway seemed to be willing to just swing and trade, which Munhoz was happy to engage in and started piling up shots and hitting Caraway frequently. Munhoz kicked him in the body and Caraway was down and covered up, which allowed Munhoz to finish him with strikes. Caraway complained about that the kick to the body was low although the replay made the kick look clean to the body. Caraway seemed upset with the stoppage and then Munhoz lifted him onto shoulders and it didn’t seem Caraway was in the mood for that. This was Munhoz’s seventh win in the UFC and has won six of his last seven fights. Munhoz should get a high ranked opponent at bantamweight in his next fight as he has a very good record. It was Caraway’s second loss in a row. Chiasson had a six-inch reach advantage for the fight and was a slight favorite. Kianzad has fought at bantamweight while Chiasson walks around at 170 pounds and is the bigger fighter. Chiasson landed with knees to the body and clinched with Kianzad against the fence. She took Kianzad’s back with a body triangle applied and kept the position for the rest of the round. Chiasson took the opening frame 10-9. Chiasson dropped Kianzad with strikes by the cage in the second round. Kianzad was unsuccessful with an armbar attempt and gave up her back in the process. Chiasson had the back and submitted her with a rear-naked choke. Chiasson will find herself in a weird spot having won TUF but is only 4-0 as a professional. The problem is she is in a division with no challengers for Cris Cyborg and could be fast-tracked to a title fight in a short period, although is nowhere ready for such a massive leap in competition. Espino is 38-years old and a minus 160-favorite going into the fight. Frazier was the last pick on the show and made it to the final. Espino took Frazier down immediately and was in full control of Frazier as he mounted the back. Frazier escaped and got to his feet but not for long as Espino got another takedown. Espino applied a keylock from the crucifix position for the tap and a dominant performance. Espino trains out of American Top Team and been fighting for almost a decade. His only loss is to former Bellator champion Vitaly Minakov and that his second professional fight in 2011. Since that loss, he has won seven fights in a row. As a heavyweight, his age isn’t the same detriment it would be at a lower weight class but he’s still entering the UFC at 38. Usman has won his last eight fights while Dos Anjos is coming off a bad loss to Colby Covington in June for the interim title. RDA just passed the 10th anniversary of his UFC debut and has won 17 fights inside the organization. The opening round saw Usman get the early takedown. Dos Anjos was up and they battled by the fence before Usman got another takedown in the final minute. Dos Anjos landed a big up kick near the end of the round but I scored it 10-9 for Usman based on his wrestling offsetting Dos Anjos’ striking. The second round saw Usman take him down and enter his guard and rolled out of a kimura attempt by Dos Anjos. On their feet, Dos Anjos ended the round with some kicks to the legs and I had it even at 19-19 after two rounds. Usman was more aggressive with his strikes at the start of the third round while mixing in takedowns, which were there for the taking by Usman. It was Usman’s best striking round so far in the fight and is ahead 29-28 on my card. By the fourth round, Usman was relaxed with his striking and applying lots of pressure when putting Dos Anjos against the cage and set up the takedown with ease. In half-guard, Usman landed short elbows and gave no inch to Dos Anjos. This was Usman’s most dominant round and I’d go 10-8 and 39-36 overall for Usman. The fifth round continued Usman’s dominance as he took Dos Anjos down for the tenth time as the start. Usman easily defended a guillotine and attacked Dos Anjos with hammer fists as the one-sided nature of the fight continued. This could have been another 10-8 round for Usman and a one-sided performance. I scored the fight for Usman 49-44. Usman looked excellent and totally controlled the fight. The 48-47 score was beyond puzzling as I can’t see any argument for an RDA round except for Round 2. In theory, a title fight should be next for Usman and fight the winner of Tyron Woodley and Colby Covington if they fight next for the championship. Usman showed great diversity in his striking and wrestling to control the fight and I feel both Round 4 and 5 were 10-8 rounds.